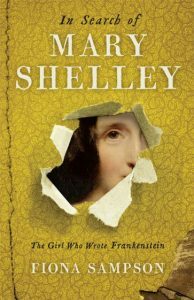 Bumper weekend for Mary Shelley! This has been a great weekend for reviews of In Search of Mary Shelley – I’m pleased to say it has been Book of the Week in both the Guardian and Daily Mail (never let it be said that I lack range! ), and was the lead review in the Telegraph (not on line unfortunately! ), and well reviewed in the Times, the Sunday Times and the Observer. My thanks to Rachel Hewitt, Ysenda Maxtone Graham, Miranda Seymour, Paula Byrne, John Carey and Rachel Cooke for their insightful and incisive discussions of this fascinating woman. You only have to look at the range of images the papers use to illustrate their stories to see the extent of her impact! If that’s not enough Mary for you, I’ll be launching the book on January 18 and with a lecture at National Portrait Gallery that evening. Click here to book your tickets. It is BBC Radio 4 Book of the Week Jan 15-19 – click here for more details – and I’ll be talking about it on BBC R4’s Start the Week on Jan 8 (here) and on BBC R3’s Free Thinking, Radio Ulster and Radio Scotland on Jan 18.